Darkening nights of autumn invite people to celebrate crayfish parties. The catches of crayfish have been very good and great number of signal crayfish are being hauled up by the crayfish pots. Even though the early summer was rather chilly, catch was excellent there and there already during the first days of season that started July 21. In August and September crayfishing will go on. 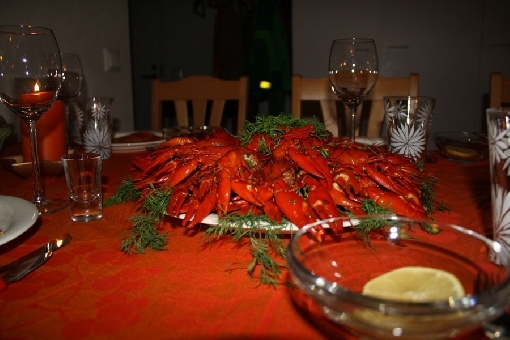 Crayfish party is a Nordic autumn tradition of its best. Boiled delicious red crayfish and association and conversation in a good company around the crayfish table are the main elements of a feast. You can also try crayfish for dishes in many other ways. Crayfish meat is a good material for e.g. wok and salads and it is easy to make delicious appetizers of them.